The latest chapter in a career that has so far exemplified experimentation and reinvention sees U2 deliver an album which, despite clear strengths and moments of excellence, treads on well-worn territory. Such a fine but flawed album is simply not enough from a band as talented, resourceful and liberated of record company constraints as U2. The CLUAS Verdict: 7 out of 10. If there has been one constant thing in the last twenty years of my life, it is U2. It won't earn me much street cred, but I will not deny that these guys are heroes of mine. But even so I can't help but thinking that their latest release suggests U2 have taken their eye off the very ball they spent a career chasing. Hear me out. Ever since the release of 1983's 'War' when commercial success first started coming U2's way, each new long-player from U2 has undergone a rigorous comparison to its predecessor. And thankfully there was invariably an ocean of musical contrast that merited the attention and debate. Often that contrast was nothing short of remarkable (as was the case with the sonic tapestry that was 1984's 'Unforgettable Fire' compared to its predecessor 'War'). However the comparison was not always complimentary (1997's risk-laden, occasionally excellent, but essentially flawed album 'Pop' being a prime example). The insistence of U2 to continually move their musical goalposts is an essential part of any serious discussion of their fascinating development and remarkable level of sustained success these last 20 years. But has their game plan changed? Have U2 decided - consciously or subconsciously, who knows? - that the time has come to stick to a familiar template and to take a pass on the envelope-pushing malarkey that characterised their studio ventures for the guts of two decades? 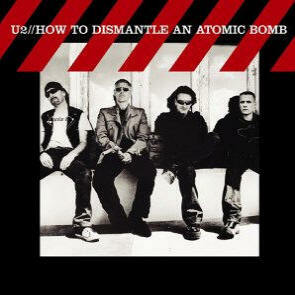 The answer, provided in the form of their new release 'How to dismantle an atomic bomb', appears to be a clear 'Yes'. Not that this album is a dud - far from it - it is a solid, occasionally brilliant record that will probably appear, deservedly, in many serious music fans' top 5 albums of 2004. The problem is that for the first time in U2's career they've released a studio album that offers no discernable trace of evolution from its predecessor. Put simply, every single track on this new record could have appeared on their last studio record 'All that you can't leave behind' and it would not feel or sound out of place. The same thing simply can't be said about any other two consecutively released studio albums in U2's canon. To paraphrase that mighty track on their previous album, are U2 stuck in a moment that they don't want to get out of? HTDAAB kicks off with the first single from the album, the brash and immediate 'Vertigo'. Drawn from the same vein as 'Elevation' from 'All that you can't leave behind', 'Vertigo' is however a totally different - and superior - proposition. Confident where 'Elevation' was forced, 'Vertigo' shows that U2 have managed to rediscover (albeit briefly) what it takes to make an excellent track that sounds like it was knocked off down the garage in an effortless 5 minutes. 'Miracle Drug' - a remarkable rush of a track that follows 'Vertigo' - is home to the bizarre, intriguing but effectively meaningless lyric "Freedom has a scent like the top of a new born baby's head". But the way Bono delivers the line gives it a profundity that belies the words he sings. Remarkable to behold. Like the rest of the track. Yes, 'Miracle Drug' is a highlight of the album, brilliantly working from the template of many other U2 tracks in the past: starting out with a subdued - but securely buoyed - introduction, then launching into a driving, soaring trajectory, all governed by the Edge who provides some dramatic guitar. Despite such praise there is one caveat: this track exhibits some suspiciously close ties to key moments on 'Beautiful Day', also from their previous album. I'll resist the temptation to give a second-by-second dissection but suffice to say that there is a remarkable similarity between a) the choruses of both tracks (particularly in how the drumming propels each song through their respective choruses), and, b) Edge's guitar at certain points on the two tunes. Yes, both songs sound nothing like each other but something here refuses to sit right. Then, as if to reinforce my fresh suspicions, along comes 'A man and a woman', a soulful but somewhat inoffensive acoustic number, that is basically a hybrid of 'In a little while' and 'Wild honey', both also from the previous U2 album. Hmmmmm. Nonetheless there are songs here that are immune from any such pedantic dissection. "Sometimes you can't make it on your own" is one such offering. An emotional, deeply personal paean to the memory of Bono's late father it has a falsetto chorus that works in ways your heart never expects. "One step closer" is a simple, intimate and atmospheric slice that burns beautiful. "Crumbs from your table" and "Origin of the Species" are two other tremendous tracks. Time will probably judge "Crumbs?" as one of more enduring tracks from this release, it could even be U2 at the top of their game. As for "Origin?" it has, towards its end, a particularly joyous passage where Bono sings with what can only be called a terrific combination of soulful abandon and genuine delight. But it's not all honey to the ears. Take "City of blinding lights". I warmed hugely to it on my first listen - something which is rarely a good sign. Indeed after a few more listens I realise that not only is it cut from the same cloth as Coldplay's 'Clocks' but it is - at best - an average song camouflaged with some polished production. But it is a gold-plated classic compared to 'All because of you' which, to be blunt, is throwaway B-side material. How it made the final track listing genuinely astonishes me. As a studio work it is fickle, unimaginative and hugely underwhelming. And it is going to be the next single? The mind boggles. Probably the most adventurous song on the album is "Love and Peace or Else", a dark and dirty number (one that, curiously, has moments which suggest Edge has been listening to the White Stripes). That this, the most left-of-centre track here, is the album's only number produced by the safe, but searching, hands of Brian Eno and Daniel Lanois I suspect is no coincidence. It's the only proof that U2's previously demonstrated eagerness to pursue musical adventure has not, thankfully, been completely lost. In a nutshell, this is a fine but flawed album. However for a band as talented, resourceful and liberated of record company constraints as U2, this is simply not enough. I hold heroes of mine to higher standards. Disagree with the review? Well feel free to discuss it on the CLUAS Discussion Board or to submit an alternative review. The writer extends his apologies to those CLUAS writers he has harassed in the past about the need to stay within a 700 word limit when reviewing albums for CLUAS.com.